This webpage is dedicated to an exceedingly rare fancy reddish-orange diamond weighing 3.15-carats, the largest diamond of this color ever offered at an auction, that appeared at Christie's New York Magnificent Jewels Sale held on December 10, 2012 and set a world record for a diamond of this color, not only for whole stone price but also for price-per-carat. A letter accompanying the report further stated that the diamond is the largest fancy reddish-orange, natural color diamond to be graded at the Gemological Institute of America as of the date of the report. Is the circular-cut reddish-orange diamond actually a modern round brilliant-cut ? In the Lot Description above GIA does not explicitly specify that the cut of the diamond is circular. There are three types of circular-cut diamonds, developed during the evolution of the modern round brilliant-cut beginning from year 1750 - They are 1) Old European brillant-cut 2) Circular brilliant-cut and 3) Modern round brilliant-cut. GIA reports for round brilliant-cut diamonds usually specify whether the diamond is Old-European, Circular brilliant or Modern round brilliant. The actual GIA report for this reddish-orange diamond is not given. 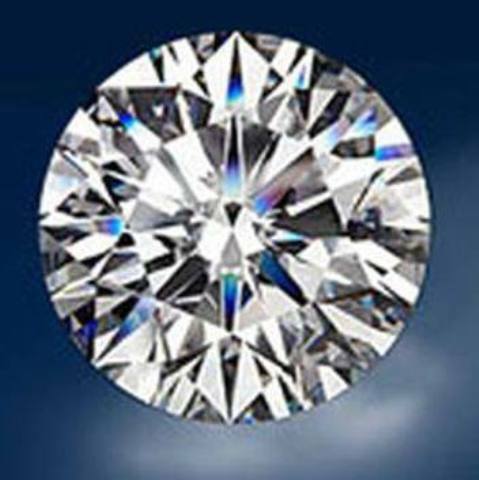 But, according to the Lot Description if we assume that the GIA had designated the diamond as a circular-brilliant, it must without any doubt meet three criteria set by GIA to decide whether a given round brilliant is a circular-brilliant. These criteria are :- 1) Star length less than or equal to 50%. 2) Lower half length less than or equal to 60%. 3) Culet size medium or larger. A careful examination of the three images of the reddish-orange diamond given above shows that only the first two criteria set by GIA has been met. The culet size of this diamond is extremely small or just a point as in modern round brilliant-cut diamonds. Thus only two of the above criteria set by the GIA for circular-brilliant cut diamonds have been met. Hence, the reddish-orange diamond shown in the images above is definitely not a circular-brilliant diamond. Neither is it an Old-European brilliant-cut diamond, because the culet size in such diamonds are the largest for circular-cut diamonds. Hence, the obvious conclusion about the circular-cut of this reddish-orange diamond, is that the cut is a Modern round brilliant-cut. 1) The table of the diamond as seen in image-1 is a large octagonal-shaped table, which is approximately 53-57 % of the girdle diameter. 2) The total depth of the diamond is approximately 58-63 % of the girdle diameter. 3) Pavilion depth of the diamonf is approximately 42.5-43.5 % of the girdle diameter. 5) Culet size is pointed. Hence, the above five evidences clearly point to the possibility that the circular-cut of the reddish-orange diamond is actually a modern round brilliant-cut and not a circular-brilliant. The only uncertainity is the crown angle, which cannot be estimated from an image, but appears to be higher than the usual crown angle of a modern round brilliant-cut of 34 to 35.5 degrees. The common feature of all these modern round brilliant-cut diamonds is a large table facet and a pointed or very small culet. Modern round brilliant-cut reddish-orange diamond with large table and pointed culet. The diamond being fancy reddish-orange as certified by GIA, the primary color of the diamond should be orange, with a secondary reddish tinge. However, in actual appearance, the diamond seems to have a 50-50 combination of both orange and red. 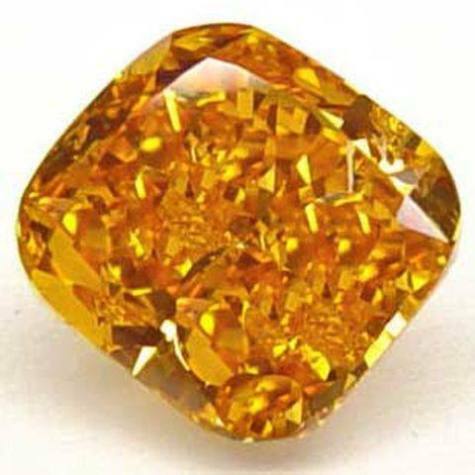 Canary yellow, amber and orange-colored diamonds are Type 1b diamonds, in which color is caused by nitrogen atoms scattered as single atoms. In Type 1a diamonds nitrogen atoms are found in groups or aggregates of two or more atoms. Almost 98% of all natural diamonds belong to Type 1a. 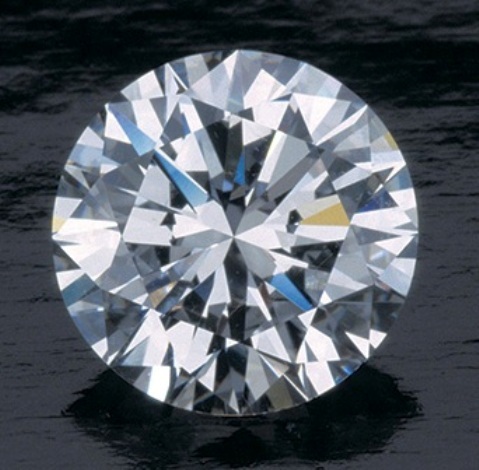 Type 1b diamonds constitute only about 0.1% of all naturally occurring diamonds. Scattered single nitrogen atoms absorb visible light in the blue end of the spectrum, causing its complementary colors, such as intense yellow known as canary yellow, or amber (yellowish-orange) or orange to manifest itself. Orange color is produced by the absorption of visible light by a broad band situated at 480 nm in the blue region of the spectrum. 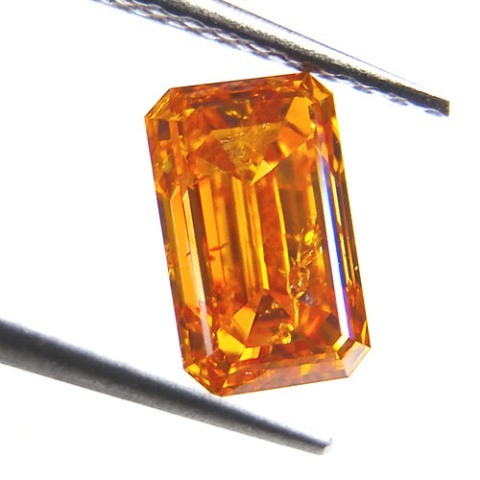 As only 0.1 % of all naturally occurring diamonds belong to this group, the canary yellow, amber and orange colors are extremely rare in diamonds. This explains the rarity of the 3.15-carat, fancy reddish-orange diamond. Hence, without any doubt the 3.15-carat, circular-cut, fancy reddish-orange diamond is a Type 1b diamond. The Orange color, one of the component colors of this diamond, is thus caused by scattered single nitrogen atoms. However, what causes the other component color of this diamond - Red ? In the visible spectrum orange lies between yellow and red. Hence, common secondary colors found in orange diamonds are yellow, pink, and sometimes a tinge of red, giving the combinations of yellowish-orange, pinkish-orange, and reddish-orange. The secondary red color in this diamond is more than a tinge, which cannot be explained on the basis of complementary colors. Hence, we should look for an alternative explanation for the component red color in this diamond. Fancy colors in diamonds such as red, pink, purple, and brown are caused by plastic deformation in the crystal structure of the diamond. The distorted areas in these crystals impart rare fancy colors to the diamond such as pink, red, purple, etc. by absorbing light in different regions of the spectrum. 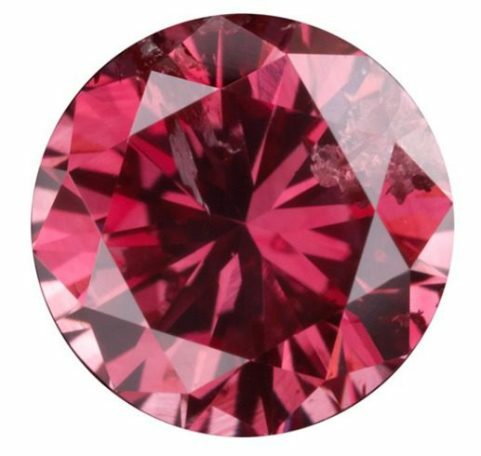 If such distortions occur in nitrogen-free Type IIa diamonds which are absolutely colorless, they can impart rare fancy colors such as pink, red, purple, brown to these diamonds. 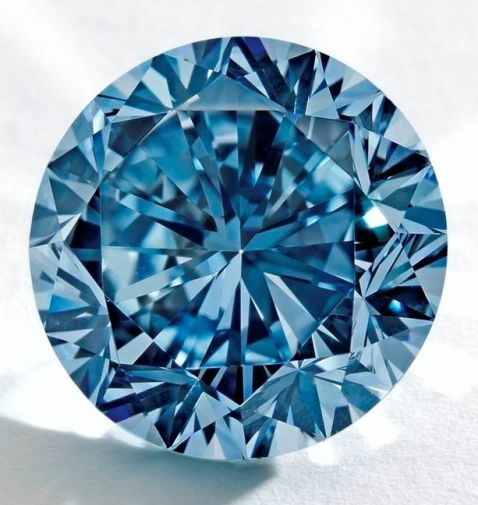 Such rare fancy colored Type IIa diamonds constitute only about 0.1% of all naturally occurring diamonds, whereas absolutely colorless Type IIa diamonds constitute about 2% of all naturally occurring diamonds. Thus, the cause of the red component in the diamond appears to be structural distortions in the crystal as in Type IIa diamonds. Hence, the reddish-orange color of the diamond is the combined effect of both plastically deformed centers as in Type IIa diamonds and scattered single nitrogen atoms as in Type 1b diamonds. 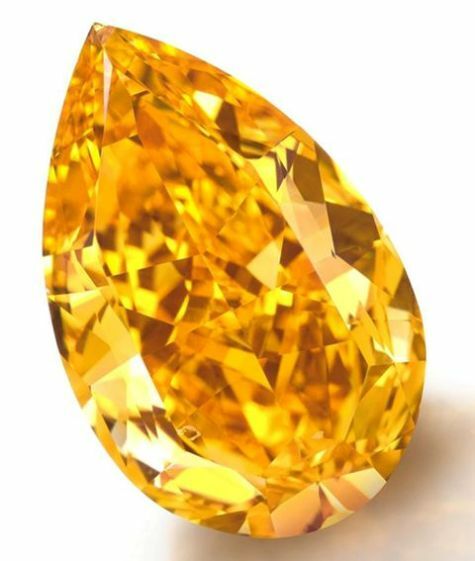 However, since the orange color of the diamond is caused by scattered single atoms of nitrogen, whose presence is detectable, this diamond is still categorized as a Type 1b diamond. 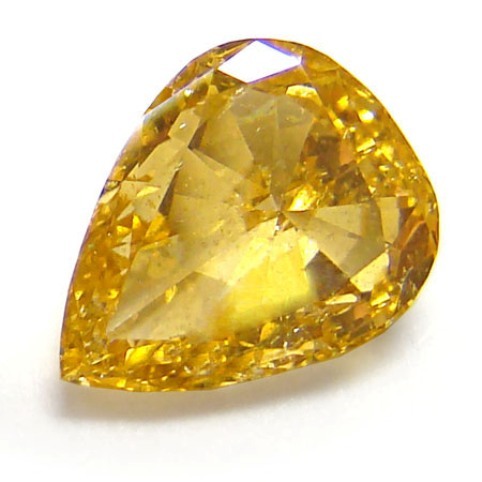 The occurrence of Type 1b diamonds, which consist of canary yellow, amber and orange colored diamonds, it was pointed out earlier, is less than 0.1% of all naturally occurring diamonds. 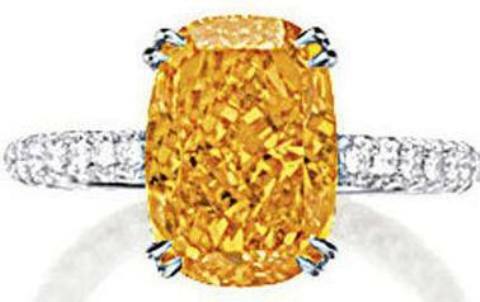 However, in actual practice the occurrence of orange diamonds is even much less than 0.1%. According to Edwin Streeter, the famous gemologist, orange diamonds which he referred to as "Fire diamonds" are exceptionally rare in nature. According to him, so few have been graded in the world that the origin of their colour still bears a part of mystery. According to GIA, not only are orange diamonds extremely rare in occurrence, but their sizes are also small, rarely exceeding 3 or 4 carats in size when polished. In GIA's coloured diamond grading system, as the colour appearance of strongly coloured diamonds transitions from orangy yellow to orange the occurrence becomes progressively more rare -i.e.- the less yellow present the more rarely they occur. 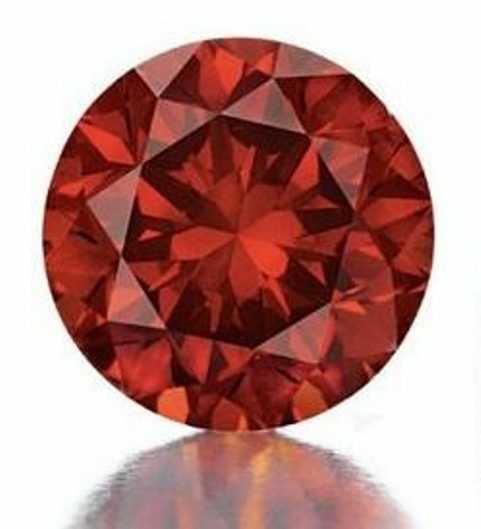 Plastically deformed Type IIa Red diamonds are as scarce as the Type 1b Orange diamonds. A statistical estimate at the Argyle mines in Australia, has shown that only one carat of pink diamond is produced for every one million carats of rough diamonds. This works out to an extremely low percentage of 0.0001 %. The red diamonds produced in these mines are even scarcer than pink diamonds. Therefore the frequency of occurrence of red diamonds must be less than 0.0001 %. Thus red diamonds are extremely rare in occurrence. The Phenomenon of red diamonds is extremely rare, so much so, that if one says that only a very small number of natural red diamonds exist in the world today, it is not an exaggeration. Actually the number of diamonds certified as red, existing in the world today, is less than twenty. Therefore, seeing a red diamond in public is an extremely rare event, let alone being available for sale. The recorded sales of red diamonds are few and far between. 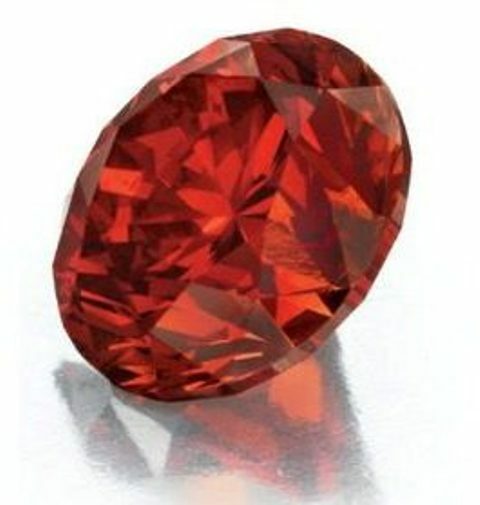 After the 1987 sale of the 0.95-carat Hancock Red diamond for $ 880,000, the next recorded sale is that of the 5.11-carat Moussaieff Red in 2001 for $ 8 million. This is an indisputable statistical evidence for the rarity of the diamond. 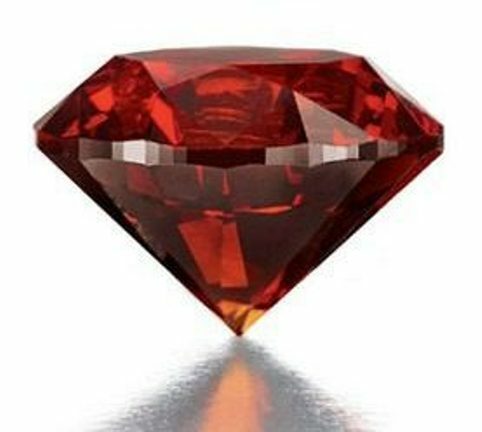 The following is a list of known red diamonds existing in the World tody, that includes known famous red diamonds as well as red diamonds that appeared at the sale of famous auction houses and performed impressively creating auction records. The number of red diamonds in this list is less than 20. The above statistics show that red diamonds after cutting and polishing have restricted sizes. 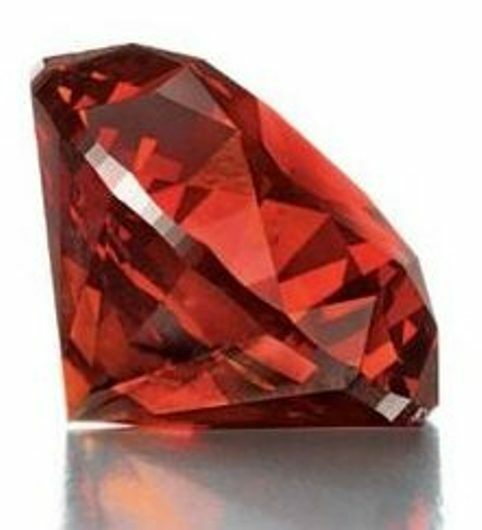 The worlds 1st, 2nd and 3rd largest red diamonds Moussaieff Red, Kazanjian Red and De Young Red have carat weights of 5.11, 5.05 and 5.03 respectively. Most of the red diamonds are less than 2.00 carats in size. Thus in red diamonds extreme rarity seems to be combined with restricted sizes. How rare are orange diamonds ? The number of diamonds certified as orange that appeared at public auctions is less than 10. In the table of known famous orange diamonds arranged in descending order of carat weights given below, the first five diamonds appeared at various auctions conducted by Christie's and Sotheby's and performed impressively creating auction records. In fact the first diamond in the table, also holds the current record for price-per-carat for any diamond in the world. This table will be updated as more orange diamonds that appeared at public auctions come to light. However, from No.6 onwards significant orange diamonds in private collections and in the collections of renowned diamond dealers that are on offer for sale with GIA certification have also been included. South Africa and Australia are the main sources of orange diamonds in the world today, and going by the large numbers of orange diamonds available for sale at renowned diamond dealers, one is led to the obvious conclusion that orange diamonds are not so scarce as red diamonds. In fact, orange diamonds are rarer than green, pink and blue diamonds, but they are not as rare as the red diamonds. 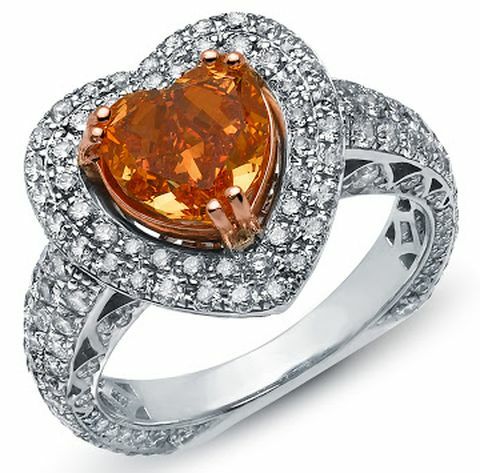 In other words, orange diamonds are the second rarest fancy colored diamonds after red diamonds. However, fancy vivid orange diamonds without any secondary colors are indeed extremely rare, and may be as rare as the red diamonds. 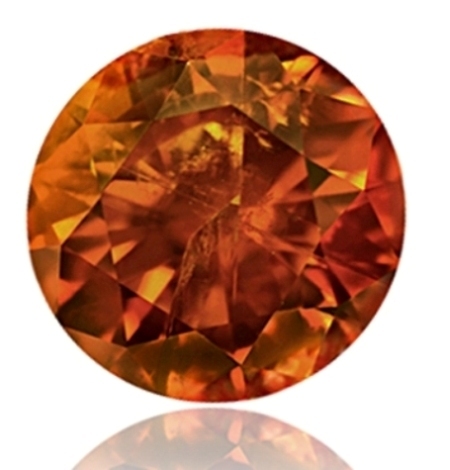 Most orange diamonds occur with modifying secondary colors such as red, pink, yellow, and brown. Orange and brown combinations are very common. 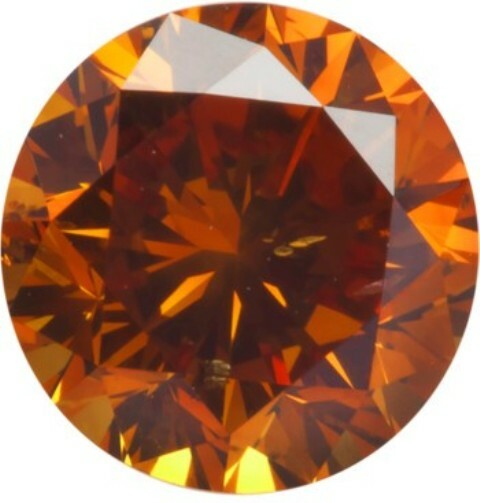 The presence of brown in an orange diamond causes a dramatic reduction in the price of the diamond. 14.82-carat, pear-shaped, fancy vivid orange diamond, the largest such diamond in the world that sold for a whopping US$ 35.5 million, at the Christie's Geneva Magnificent Jewels Sale, setting the world record for the highest ever price paid for an orange diamond at an auction, and the world record for the highest price-per-carat (US$ 2.4 million) paid for any diamond sold at an auction. 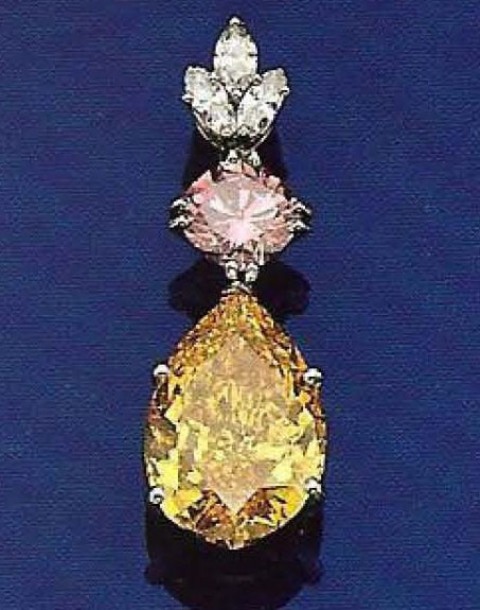 8.93-carat, pear-shaped, fancy intense yellow-orange diamond set as a pendant with a modified circular-cut fancy pink diamond, on a trefoil motif surmount set with marquise-shaped diamonds. The pendant sold for US$ 1.9 million at Sotheby's New York April 1988 auctions. 5.54-carat, fancy vivid orange cushion-cut diamond, cut and polished by William Goldberg Corporation and purchased by Ronald Winston on October 30, 1997 at a Sotheby's New York auction for US$ 1.3 million. The unnamed diamond was christened the "Pumpkin Diamond" signifying not only the vivid orange color of the diamond resembling the color of a cut pumpkin, but also the Halloween Day, that followed immediately the day of purchase of the diamond, the day on which the "jack-o-lantern" made of a hollowed out pumpkin, a popular symbol of the Halloween Day. The 4.19-carat, fancy vivid orange, cushion-shaped diamond set as the centerpiece of an 18k white gold ring, appeared at the Sotheby's Magnificent Jewels & Jadeite Hong Kong Sale, held on October 5, 2011 and sold for US$ 2,962,749, the highest price ever paid for a fancy vivid orange diamond at that time. The unnamed, 3.15-carat, round brilliant-cut, fancy reddish-orange diamond sold for US$ 2,098,500 a world record for a diamond with reddish-orange hue, both in terms of whole stone price and price-per-carat. 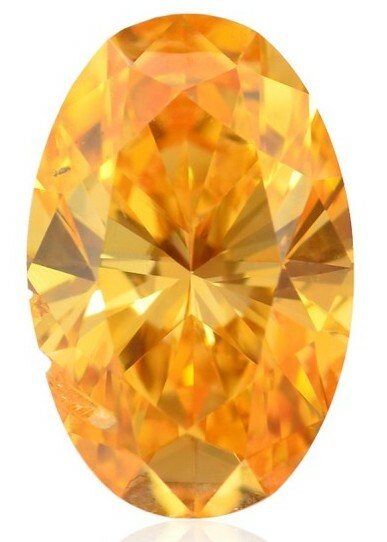 The 2.01-carat, pear-shaped, fancy deep yellow-orange diamond with dimensions of 11.17 x 6.26 x 3.83 mm and of Central African origin, has a perfect cut, polish and symmetry and is moderately priced at US$26,000. 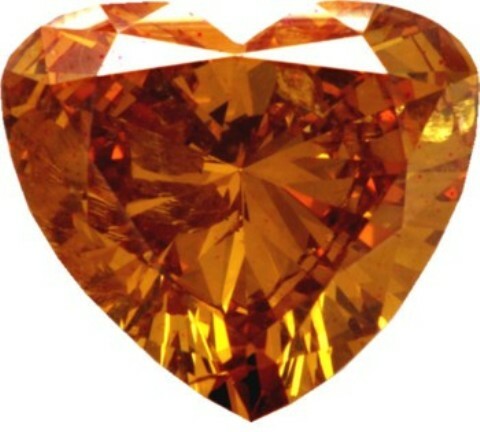 The 1.46-carat, heart-shaped, fancy deep orange diamond with dimensions of 8.44 x 7.57 x 3.92 mm and of Congo origin with a perfect cut, polish and symmetry, and accompanied by an IGI certificate bearing No. F3B58691 is moderately priced at US$ 19,000. 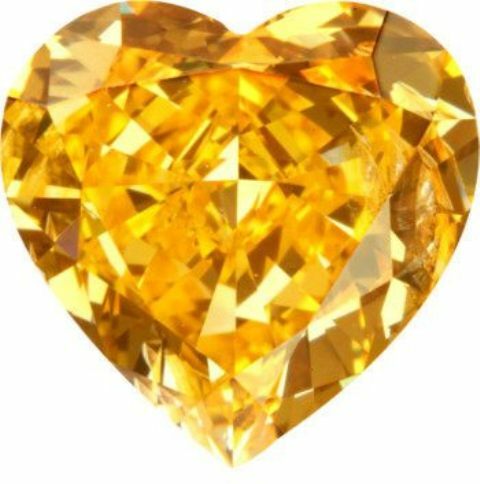 The diamond is a 1.15-carat, heart-shaped, fancy vivid yellowish-orange stone of South African origin, with dimensions of 6.62 x 6.77 x 3.72 mm. The diamond accompanied by a GIA certificate bearing No.1122327301 is priced at US$ 54,000. 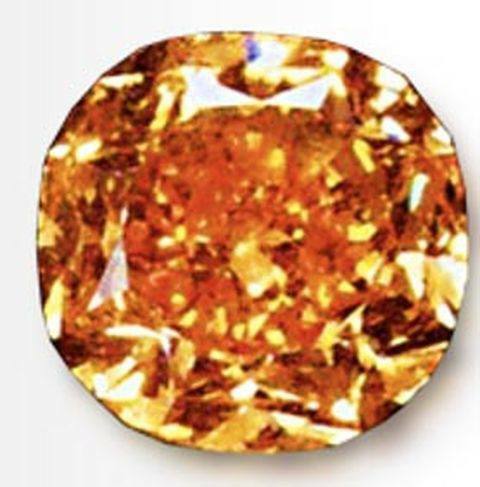 The 0.98-carat, round brilliant-cut, fancy deep orange diamond, with dimensions of 6.23 x 6.29 x 4.04 mm and accompanied by IGI certificate F6D87190 is priced at US$ 20,000. This diamond in spite of its smaller size, has an intrinsic beauty that surpasses the beauty of even the largest orange diamonds. The perfect modern round brilliant-cut of the diamond with excellent polish and symmetry is complemented by its fancy deep orange color and good clarity, enhancing the beauty and value of this diamond. The Lady Orquidea diamond is a 2.00-carat, fancy vivid orange, heart-shaped diamond, mounted as the centerpiece of a white-gold cluster ring designed by Bernard Bachoura, a fourth generation jewelry designer of Sophia Fiori, for a temporary exhibition to be held from February 1 to June 30, 2013, in the Gem and Mineral Hall - The Gem Vault - of the Los Angeles Natural History Museum. Ishay Ben-David Corp. Diamond Collection - Diamond Numbers 9, 11 and 12 in the above list, are diamonds selected from the Ishay Ben-David Corp. diamond collection available for sale online at their website given below. The 1.41-carat, round brilliant-cut, fancy deep orange diamond has dimensions of 7.14 x 7.28 x 4.41 mm and is accompanied by a GIA certificate bearing No.11573076. The diamond has a pure and rich orange hue, with no secondary overtones. The inclusions in the diamond blend with its deep orange color and does not in anyway decrease the intrinsic beauty of the stone, ideally suited to be among the collection of a connoisseur of rare natural fancy colored diamonds. Another amazing creation by Ishay Ben-David Corp. is the 1.10-carat, emerald-cut, fancy vivid-orange diamond, a rare collector's diamond, with a true pumpkin color, technically referred to as fancy vivid orange, with no secondary hues. The color saturation of the diamond is maximum and the color evenly distributed. The sheer brilliancy and extreme saturation masks the slight inclusions in the diamond to the naked eye. The diamond is priced at US$ 260,000 and is accompanied by a GIA certificate bearing No. 1142307416. The 1.00-carat, modified cushion-cut, pure orange diamond with a color-grading approaching fancy intense to fancy vivid has been offered for sale at the URL of U.S.I. GEMS, Manufacturers, Wholesalers and Exporters of White Loose Diamonds, Natural Fancy Colored Diamonds & EGL Certified Diamond Jewellery. Nothing is known about the early history of the diamond such as the country and mine of origin, the date of discovery, characteristics of the rough diamond, the person or company involved in the cutting of the rough diamond etc. However, in the past the Zwartruggen dikes of South Africa, had been identified as a relatively prolific source of amber and orange colored diamonds, with 2-5 % of the output from these mines being amber or orange colored. A small number of amber and orange diamonds were also found in the output from the Finsch and Premier mines. South Africa and Australia are the main sources of orange diamonds in the world today. 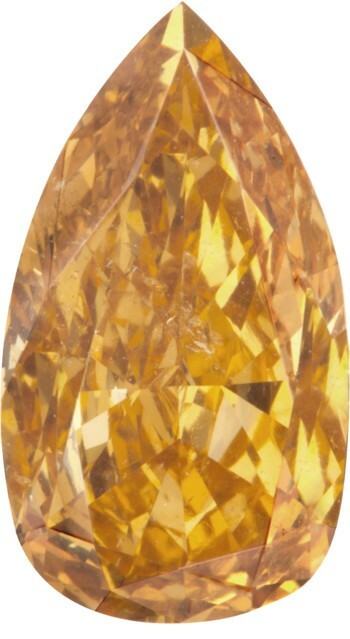 Occasional orange diamonds have also surfaced from mines in other African countries, such as the Central African Republic and Congo. In 2010, a 7.53-carat orange rough diamond was discovered during operations in Namakawa's southeast node in the northwest of South Africa which was subsequently sold at Namakawa Diamonds Johannesburg tender for US$ 1.33 million. This rough diamond is believed to have the potential of achieving not only a fancy vivid grade but also a flawless clarity grade. Lot 318 at Christie's New York Magnificent Jewels Sale 2604, held on December 10, 2012, was titled "An Unmounted Circular-Cut Colored Diamond." A pre-sale estimate of US$ 700,000 - 1,200,000 was placed on the lot. After a keenly contested bidding process Lot 318 achieved a record-breaking price of US$2,098,500 which was three times the lower estimate of US$700,000 and 1.7 times the upper estimate of US$1,200,000. The price achieved by the diamond, not only set a world auction record for a reddish-orange diamond, but also the world record price-per-carat of US$666,200 for a reddish-orange diamond at an auction. Apart from this, Lot 318 also became the second highest selling lot at this auction after lot 278 - A rectangular-cut, D color potentially flawless, 50.01-carat diamond set in a ring by Graff - which sold for US$8,370,500. Incidentally, the diamond ring was purchased by the original designer, Laurence Graff himself, who after his successful purchase commented, "This is the third time that I have owned this beautiful diamond and I am as thrilled today as I was the first time. Diamonds of this exceptional caliber have a life and legacy that carries on beyond us all. This is one of the finest D-color diamonds in the world and I am delighted to have it back again." 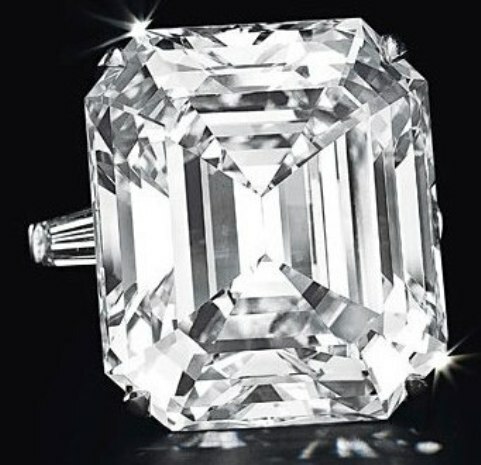 Graff purchased the same ring for US$4.2 million at a Christie's auction in 2005, according to Rahul Kadakia, head of jewelry for Christie's Americas and Switzerland. "The near doubling of the price over seven years demonstrates the increasing strength and stability of the global diamond market," he said.